Earlier this week I was at Alexa Dev Day at the A.J. Bell Stadium in Salford, Greater Manchester, learning about coding Alexa Skills for the Amazon Echo, Echo Dot, and other devices. I was amongst 100 or so local developers who were keen to learn how to leverage the power of voice, to provide useful services to users. We learnt how to build 'Skills', hosted on the Amazon Web Services (AWS) cloud platform, utilising 'Lambda' Functions, written in NodeJS. After the initial demo labs in the morning, and a delicious lunch, I spent some of the afternoon building a prototype for an app, based on my knowledge in the GPS Navigation field. 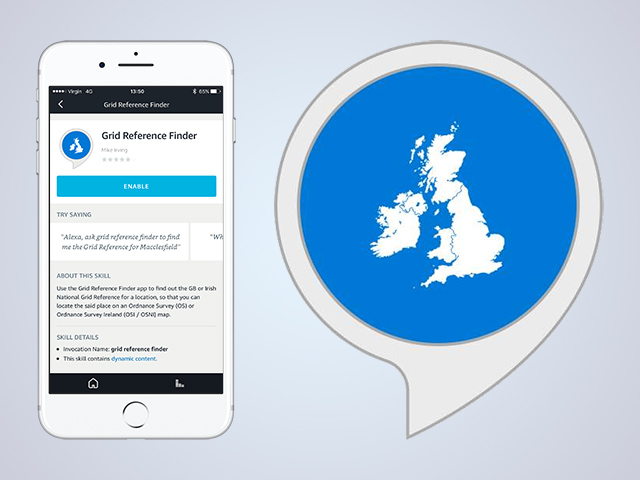 A few days later, and I am pleased to announce that Grid Reference Finder is now available as a Skill to add to your Echo, Echo Dot, or AVS (Amazon Voice Service) device. The Skill looks up the GB or Irish Grid Reference of a given place name, and utilises some of the same algorithms found in, for example, my Grid Ref UK and Ireland mobile app. Technically speaking, no pun intended, the AWS Lambda function calls a Web Service hosted on Microsoft Azure, which in turn looks up a location with the Google Maps API Web Service, performs the 'national grid' conversion, and then passes the result back to AWS, to be fed back to the user. I may move all the code into AWS at some point, it is only like this as my gps functionality pre-existed in C#. Alexa, open Grid Reference Finder. Find me the GB Grid Reference for Macclesfield. What is the Irish Grid Reference for Dublin? To enable the Skill on your device, open the Amazon Alexa companion app on your smartphone, tap Skills, and search for Grid Reference Finder. Now that my interest has perked up, I may program other similar Skills in the near future. With several million Echo devices sold, Amazon is the clear leader in the 'smart speaker' sector at this stage.